The Tokaji Wine Region Historic Cultural Landscape consists of 28 named villages and 7,000 hectares of classified vineyards. It is the origin of Tokaji aszú wine, the world's oldest botrytized wine. This agricultural landscape represents a distinct viticultural tradition that has existed for at least a thousand years. The Hungarian World Heritage Sites never seemed very appealing to me (with the exception of Budapest), and it never crossed my mind to plan a trip to Eastern Hungary as the main destination. But we took the opportunity to visit Tokaj and the Hortobágy National Park on the way home from Slovakia to Austria in August 2014. Tokaj is only about 100 kilometres from Aggtelek (where we visited the karst caves), and it's just a further 1.5 hours drive to the Hortobágy National Park, so we gave in to the temptation and made a detour to tick off these two WHS. 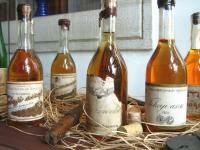 The Tokaj Wine Region is best-known for the sweet wines, the most famous is the Tokaj Aszú. It is made from raisin-like dry grapes that were affected in the vine by the Botrytis fungus. This 'noble rot' gives the wine its special flavour, but it depends on the weather and does not occur every year. The tradition of wine making in the Tokaj region is centuries old, the first vineyards were established as early as in the 12th century. And Tokaj was among the first WHS, that are dedicated exclusively to viticulture. However, the outstanding value of such a WHS should be visible in the specific features of the agricultural landscape or by a typical rural architecture. 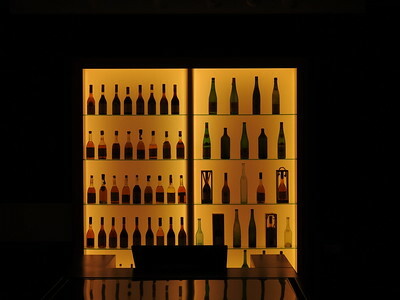 But in this respect Tokaj is very similar to other wine regions in Europe, there is nothing really exceptional, and e.g. the Upper Middle Rhine Valley, Wachau or Lake Neusiedl are much more scenic landscapes. But maybe I'm biased because I always lived in or near wine regions, so I'm used to see vineyards, and even though I like this kind of cultural landscape, vineyards mean nothing special to me. The town of Tokaj is the tourist centre of the wine region and its most lively place, it is located at the southeastern edge of the core zone. Near Tokaj are also the steepest vineyards, the upper photo shows the terraces of the Lencsés slope. We spent a half day driving along the main road of the wine region from Tokaj to Tállya (about 25 kilometres) and we stopped here and there for a short walk through the vineyards. One of the most picturesque places was a small white chapel in the midst of the vineyards near the town of Torcal. But all in all, we were rather disappointed. 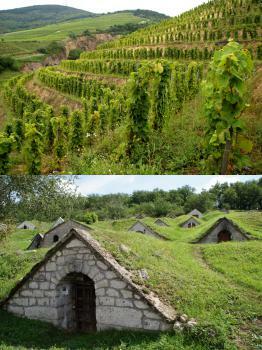 We also went to two of the exclaves of the WHS, the Köporosi and Gomboshegyi wine cellar rows in the village Hercegkút (lower photo), 35 kilometres northeast of Tokaj. Each of the two places has about 70 to 80 of these wine cellars deeply dug into the hillside. But it was not possible to visit one of the cellars, everything was closed, seemingly tourists only rarely go to Hercegkút (probably only WHS enthusiasts), we were the only people around. In the evening we went to a wine tasting at the Rákóczi cellar in Tokaj. In general, I prefer dry wines, but some Tokaj sweet wines tasted very good, so we bought some bottles of our favourite. And finally, after our return to Austria, on a mild summer evening on our balcony, a bottle of Tokaj wine and a selection of fine cheeses attenuated our negative assessment of the Tokaj WHS. Tokaj is a picturesque town at the confluence of the Tisza and Bodrog rivers. Having grown rich from the fruits of their labours, the residents built a number of prestigious buildings, including civic buildings, wine cellars and the Grand Synagogue. Tokaj is accessible by train from Miskolc and Debrecen. Where the rivers of Tisza and Bodrog meet is the location of the small town of Tokaj, the central town in the Hungarian wine growing region with the same name. Actually Tokaj is only one of 28 towns and villages in the the Tokaj-Hegyalja region. But it was here it once started back in the 15th century even if there are traces of settlements in the area going back to the dawn of man. It was when Pope IV had lunch in Tokaj and fell completely in love with the wine, rumour of its superior quality started to spread across Europe. Today all of that is history and Tokaj is a nice little village full of vineyards and nesting storks. I went for a wine tasting session at the Rakoczi Cellar, one of the more famous in town, got my own guide and a set out to try the best-of-the-best wines the house could offer. And what better thing can you do on a late afternoon than sipping excellent Tokajer wine followed by a four-course meal at the best restaurant in town. And the best of it all was that it did not make any substantial hole in my budget, which a similar exercise for sure would have done in France. For a true wine-freak there is much to do and see in the Tokajer area. Opposite the town, on the other side of the two rivers, lies a nature reserve and there are numerous vineyards to visit and wine to buy. So why not bring your car and load up with one of the best wines on offer in this part of the world. From "Tokaji Wine Region Cultural Landscape" to "Tokaj Wine Region Historic Cultural Landscape"
Damaged in World War II: Szerencs Bridge was destroyed by the Germans in WWII. Salt: Tokaj was an important medievil centre of the salt trade. 119 Community Members have visited.